Mostly clear this evening. Becoming mostly cloudy with showers developing after midnight. Low 46F. Winds SSW at 10 to 15 mph. Chance of rain 40%..
Mostly clear this evening. Becoming mostly cloudy with showers developing after midnight. Low 46F. Winds SSW at 10 to 15 mph. Chance of rain 40%. Canola prices took a large drop on March 29 when the Canola Council of Canada put out a press release saying that China has stopped all canola imports into China from Canada, according to Barry Coleman, executive director of the Northern Canola Growers Association. “The market dropped quite heavily that day, and has rebounded somewhat,” Coleman said. 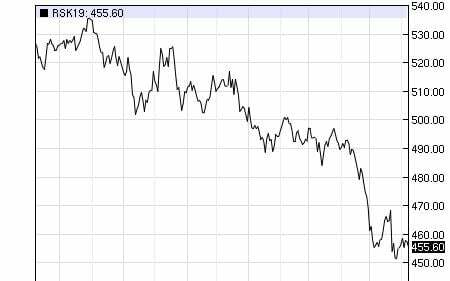 “Since March 1, when the first ban on canola imports was announced by China, the futures contracts have ranged from $448-$468, and right now we are in the middle of that range at about $458 a ton. This points to the on-going struggle of the contract’s 20-day moving average. The trade disruption is due to the arrest in Canada earlier this year of the CFO of Huawei Technologies. The U.S. requested she be arrested while she was in Canada. The canola industry in Canada is pointing to about a 10 percent reduction in canola acreage and they are still concerned about the rising ending stock of canola in Canada should China continue to keep its ban in place. China originally intended to import 4.7 million tons of canola and now they are looking to not even getting to 3 million tons for the current year, which is a 36 percent drop in canola that was planned to be imported into China, according to Coleman. Canola crushing plants cannot be easily switched over to the processing of other oilseed crops on short notice and the China government cannot afford to let canola oil supplies run low for the consumers in China. “If China was to suspend all canola purchases, sales to other buyers in the world such as Pakistan, Mexico, Japan and others would have to increase by 1.3 times to make up that lost business,” he said. Domestically, the Prospective Planting Report came out and it indicated canola plantings in North Dakota, the nation’s largest canola producer, would be 1 percent less when compared to last year’s plantings to 1.57 million acres this year. The most recent cash prices for canola at local crush plants ranges from a low of $15.20 per hundredweight (cwt) to the high end price of $16.45 per cwt. This down about 40 cents per cwt on the low end from the figures quoted two weeks ago.